SAN DIEGO, Calif. – X-1 Audio, Inc., the leader in waterproof and sweatproof headphones, has signed on to sponsor the Champion System Pro Cycling Team. Registered in the People’s Republic of China, the cyclists make up the first Asian-based UCI professional continental team. The 18-25 member team consists of Asia’s best cyclists competiting in professional tours in Europe and the U.S. in addition to the major UCI tours in Asia. The team’s season began in January, kicking off a tour of over 100 professional races around the world. For more information on the Champion System Pro Cycling Team or to see their full race schedule, please visit: http://teamchampionsystem.com. For more information on X-1 Powered by H20 Audio, please visit: http://www.x-1.com. Breaking the barriers of sound. Powered by H2O Audio technology, X-1 creates the most advanced audio solutions for athletes. 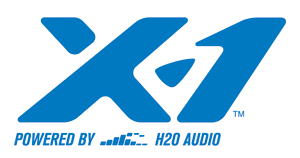 With seven patents and over a decade of technological innovation, H2O Audio, Inc., the foremost leader in headphones, cases and accessories for aquatic athletes, has evolved to the next level as X-1. Designed for all athletes, X-1 offers audio solutions to harness the power of music regardless of sport or climate. For more information or to shop online, visit www.X-1.com.